Looking for a STEM Science Camp? Atlanta offers a plethora of locations for your budding engineers, including programming, technology + engineering, architectural designs, creative builds, robotics, and more for all different grades. I know this because I’ve done my research. My girls are big into science…thank goodness since I’m such a science lover (and have a couple of science degrees, too!). We can do a ton of fun science at home (and we have), with so many kits available like a kitchen science kit or chemistry lab in a box, or even pulling out a microscope and looking really close up. We’ve also had great science fun with circuits at home. But, with a 2 year old at home, it’s nice to give my older girls a chance to interact with older kits and press their minds even further because they are really big thinkers and really like to learn new things. There are so many amazing STEM (science, technology, engineering and math) summer camps in Georgia that I had to narrow it down to the Atlanta area and in alphabetical order. It’s not too late for campers (or parents) to complete application in now! Atlanta Girls’ School offers three SMART Girls camp experiences depending on the grade of your camper, with things like string art and crime stoppers. These camps feature different themes and a variety of activities for science, math, technology, art, dance and drama. At the Big Thinkers Summer Camp, they introduce students to the awesome world of science in a fun and exciting way! Th day camp is active and explores cool science phenomena through awesome demonstrations, innovative experiments, outdoor activities, and hands-on explorations. Big Thinkers camp is full of “aha” moments! The campers get fully immersed in the science learning and witness firsthand how science is an important part of our daily lives! Brainy Bytes offers a creative and exciting environment of exploration and learning in the world of technology for children 6 and up. Minecraft Mod Design LEGO Robotics for all ages Video Game Making App Game Development 3D Printing & Animation Stop-Motion Movie Making We are about quality NOT quantity…. we keep our class sizes smaller than most to ensure everyone enjoys hands-on teaching and personal attention whenever needed from our qualified staff. In addition to our camps, Brainy Bytes offers birthday parties, home-school/after-school programs, and workshops. Club Scientific Atlanta focuses on introducing students to the fun of science through hands-on interactive experiments, adventures, and entertainment. They have developed a curriculum that allows students to experience how science works in the real world — by presenting programs in a nurturing, encouraging environment where students build self-esteem while learning. They believe that every child is a scientist and that they can make children even better scientists! All of their hands-on National Science Standard activities make science challenging and fun! Their camp Directors are highly trained college graduates, assisted by currently enrolled college students that have been trained by Club Scientific. Club Scikidz offers children and teens, ages 4-15 exciting camps in science and technology. These camps include experiments and projects in Video Game Creation, Robotics, Veterinary Science, Crime Scene Investigation, Culinary Science, Paleontology, Engineering, Space, Biology, Chemistry, Oceanography, LEGO Robotics, Medicine, Programming, 3-D Printing, Drones, and much more. Creative Career Academy welcomes campers from 8-17 in a variety of camp dates and topics. In addition to in-person camps, they also offer virtual camps. East Atlanta Kids Club offers Science and Technology Fun and Fitness Camps. They have camps in Robotics, rocketry, computing, sports, healthy eating and even include field trips. Engineering For Kids® brings S.T.E.M. education to children ages 4-14 through a variety of hands-on learning experiences. They allows students to do things like create their own video game or design a hot air balloon! They build rockets, roller coasters, and robots! With camps for pre-K through middle school, children can be care-free kids having the time of their lives at Elachee Nature Science Center. Campers will explore creeks for critters, trek through their 1,440-acre woodland, make crafts, sing silly camp songs and forge lasting friendships. For over 35 years, Elachee’s environmental education day camps have been a summer vacation favorite. In fact, new generations of Elachee campers are making their own memories, following in their parents’ footsteps! Georgia Tech’s CEISMC Summer P.E.A.K.S. (Programs for Enrichment and Accelerated Knowledge in STEM) are hands-on, interactive learning experiences. Summer P.E.A.K.S. give participants the chance to enhance learning during the summer in experiential activities on campus at Georgia Tech. P.E.A.K.S. cover many different Science, Technology, Engineering, and Mathematics (STEM) concepts. ID Tech Camps at Emory create an environment for students to take interests further and gain a competitive edge for school, college, and future careers in STEM. Campers can create apps and video games, learn C++/Java programs, mods with Minecraft, robots, and more at weeklong, day and even overnight summer science camp Atlanta programs. Imagine That offers Science, Art, Technology, Programming, Minecraft and Robotics camps and combinations of these subjects in their awesome summer camps throughout Atlanta! In fact, actually mention that their Science only camps for are their favorites! They have Wacky Science Magic for ages 5-7 and School of Magic for ages 8-11. The Summer University experience is an engaging combination of learning and enjoyment. Each summer, they design the courses to give students an opportunity to explore their creativity, challenge their minds and build new friendships. The courses are for rising 1st graders all the way to 12th graders! The setting and subjects are academic, and the tone and atmosphere is lively and fun! Fill your child’s summer free time with hands-on learning opportunities, entertainment and camaraderie. Whatever the age, whatever the interest, there are SummerU classes that meet the needs of your kids. Summer Academy at UGA offers an exciting series of over 30 specialty summer camps in Athens. The camps are for middle school & high school students who want to do amazing things. Science/Technology camps include video game design, 3D animation, aviation, robotics, engineering, and even mini-medical school. Week long hands-on science camps taught by High Touch High Tech degreed professionals. These programs feature programs ranging from CSI, Robotics, Chemistry, Physics and Rockets to Fossils, Bugs, Space, Lasers and Gemstones. There are even STEM-specific camps where student have fun and take home experiments. Kennesaw State also features summer camps in many categories for a week at a time. Some of these include science, writing, robotics, computer game design, astronomy, photography, comic book art and more. The Science of Fun STEM Camp in Decatur has specialty STEM camps with where you study and create roller coasters, slime and rockets. The themes include MAKE week (make something awesome), Tech week , STEAM week (STEM+Art= STEAM), and Teen week (advanced STEM). At StreamHQ their camps are project based and motivate critical thinking and hands-on learning. Each week kids are provided with a new challenge to enhance problem solving & out of the box thinking. Their camps are educational and a lot of fun, with benefits that will last for a lifetime! As a bonus, no previous technical background needed for students, but advanced students will be provided with vigorous challenges to enhance their skills. they provide a 10:1 student teacher ratio, individual laptops for programming and animation classes and no more than 2/3 in a team for robotics. Students in programming camps get their games and 3D modeling students get a 3D model to take home. Their camps include: Programming Game Design 3D modeling & Animation Robotics Mechatronic Engineering Camps are offered in Cobb, Fulton, Forsyth, and Gwinnett Counties. 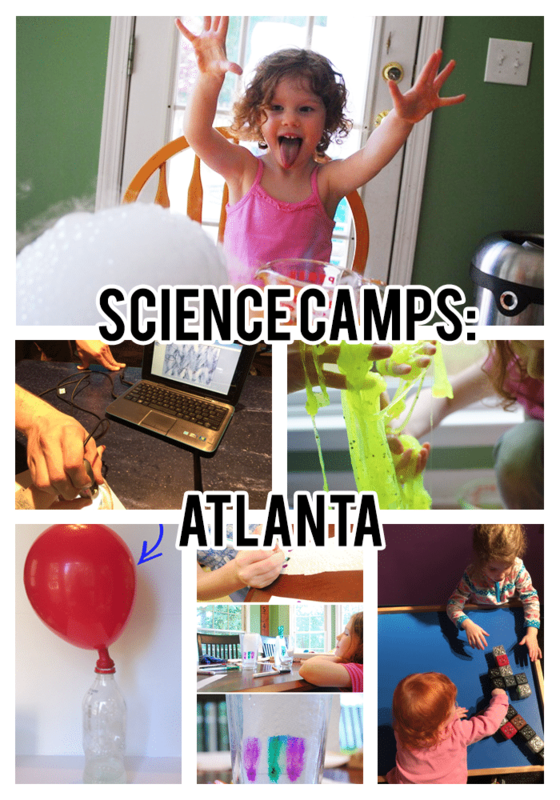 If you are looking for more summer camp options in Atlanta, check out this Summer Camp guide for the 2016 season a list of general summer camps in Atlanta, The Top 15 Atlanta Day Camps and the Best Atlanta Day Camps, more Science Camps, Athens Summer Camps, some of the Best Summer Camps in Georgia, and Best Summer Camps in Marietta as well as Summer Camps for Children with Special Needs and Summer Camps for Teens. Also check out these Christian Summer Camps. Goodness that’s a lot of science camps. Which ones do you plan to send the girls to? They seem like fun, I guess, if you like that sort of thing. I’m kidding! They do seem fun I just don’t have the love for science like you and the girls. I saw some camps I’D like to attend! And some of them do birthday parties, too! Wow! There are way more options in my neck of the woods than I thought! Maybe I can tag along for some kitchen science fun? That was always my favorite unit in school.